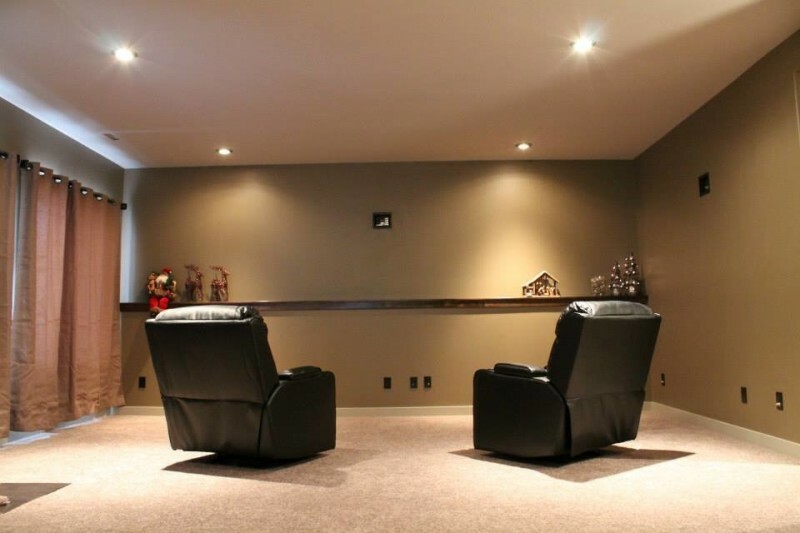 There are many ways to make your basement more stylish and attractive. One of them is by inserting the best window treatments with the best fabrics and complementary window curtain hardware. 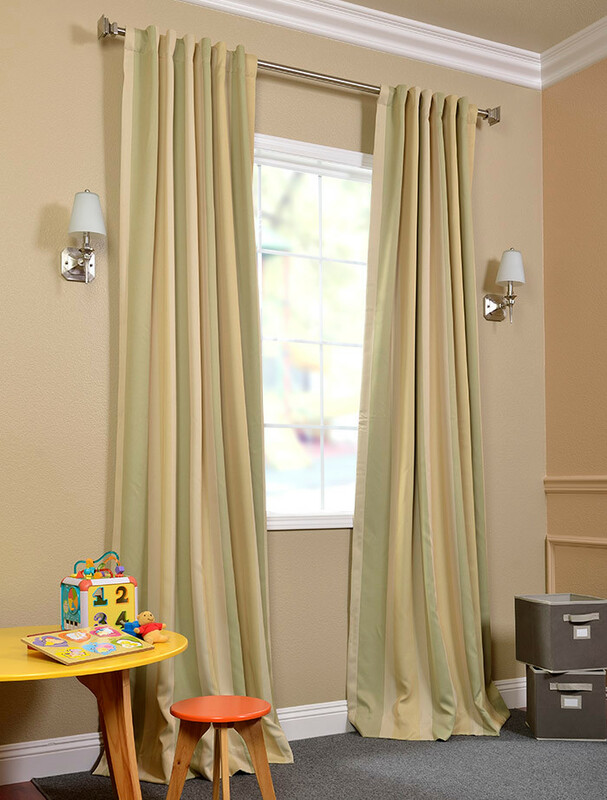 Here, there are best tens of basement window curtains that can improve your basement significantly. Make sure that you’ve selected the best one that fits your basement windows, and don’t forget to consider several things like width, height, design/ model, and color that match your basement interior. Let’s start to preview the collections of best basement window curtains. Feel warmth with this linen fabric curtains. This is one of best selections that offer low-lighted effect due to the limitation of amounts of light entering the basement. The curtains have unique jute patterns with bolder color. Woven wood shade is included to prevent too much of lights accessing the room. The room will be shaded when all curtains are closed. 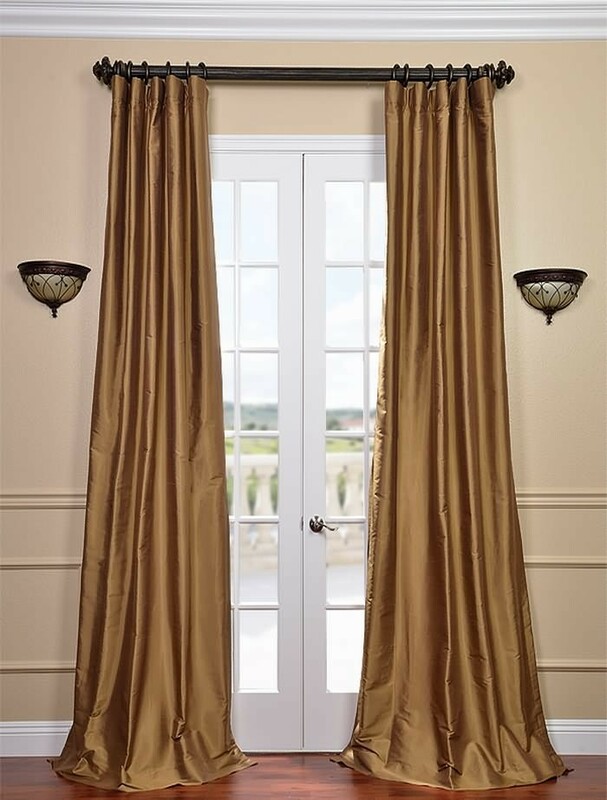 Soft toned window curtains are always be best recommendation for basement bedroom. They provide huge elegance and warmth. 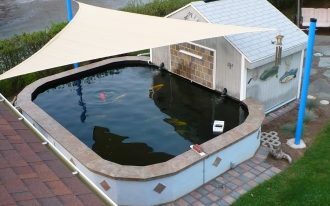 You can add a cellular shade to give more privacy. Contrast it with dark curtain hardware. 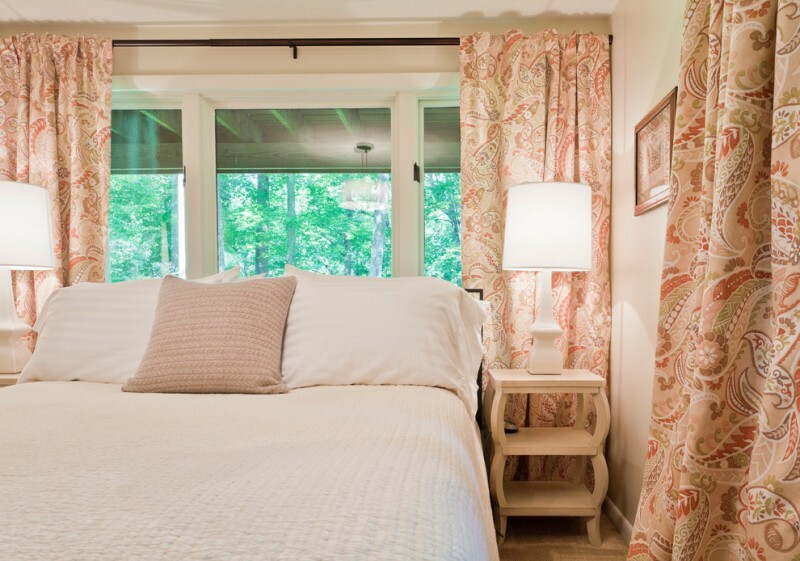 Thin, soft, and semi-transparent – Floor-to-ceiling window curtains for a basement. The color brings comforting warmth and it’s able to shade the room perfectly. And, the overall color tones of interior fit the curtains. 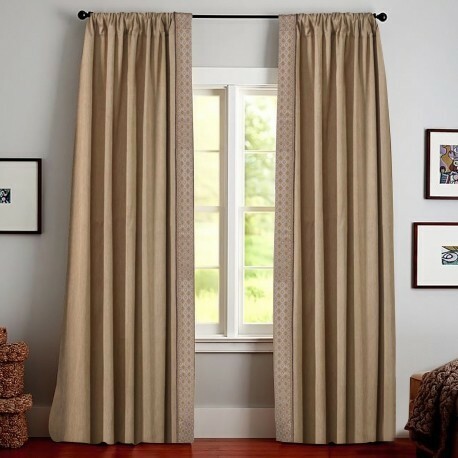 Full-height window curtains idea with ‘crowded’ patterns – a nice choice for such dominant beige open space. The curtains are most striking among other elements that just use plain and neutral colors like beige, black doff, light blue, and white. Quite recommended to try, right? Peach dominates the curtain and become a nice tone background for curtains’ traditional motifs. 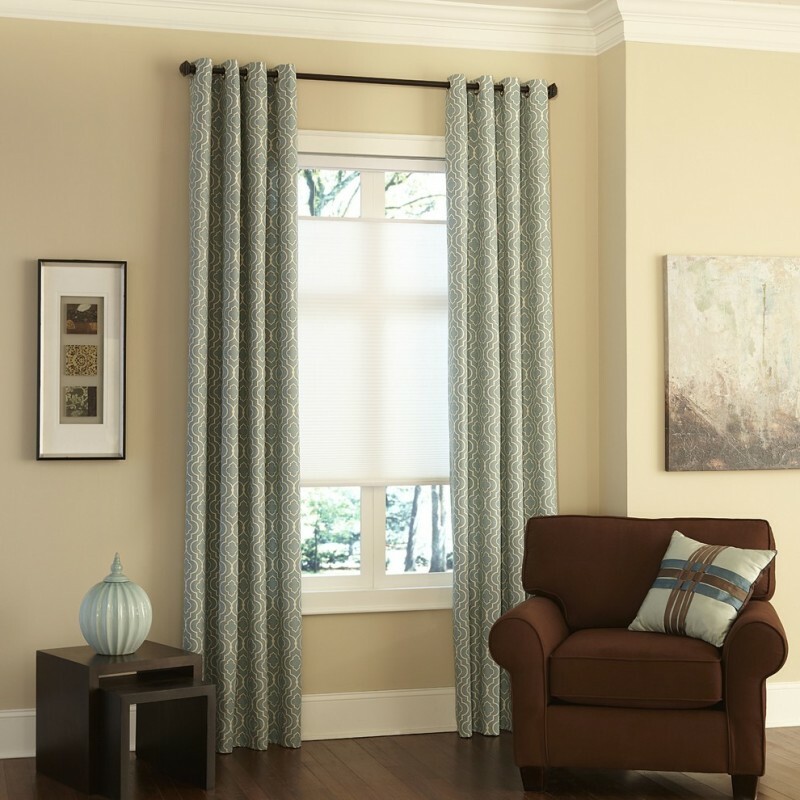 The fabrics are best quality and can fully shut the room up without remaining amounts of light. 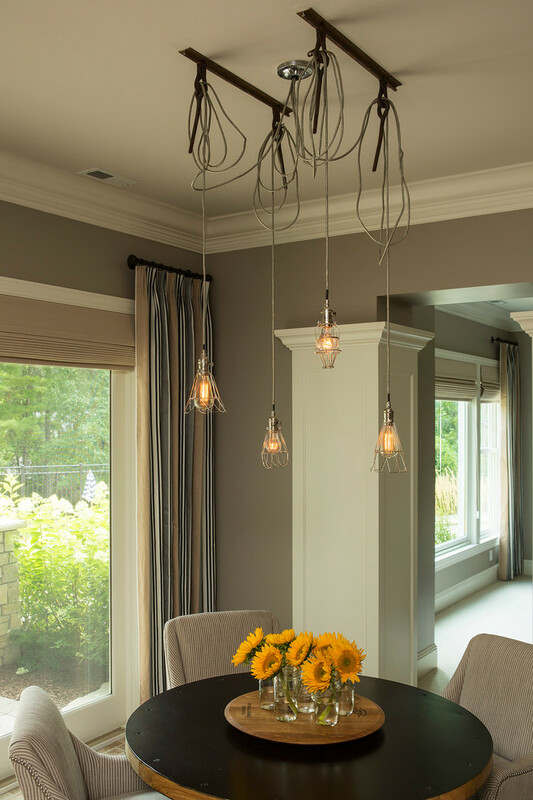 When all curtains are closed in, the homeowners just use the light fixture as the illumination. Really recommended for you guys who love full privacy for your house. It’s so marvelous! 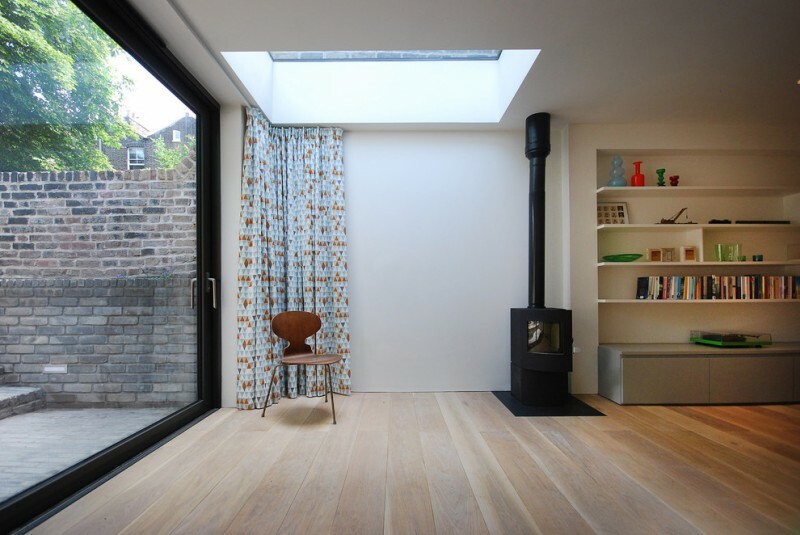 A light wood basement with white walls, recessed book rack, and black-stained wood burnt stove. The designer intentionally chooses the recessed basement curtains to shade the front door and walls around. The color combination is perfect; light blue basic color is accented with orange polka dots. Pop your basement up with such colorful window curtains. The curtains quite match for a cheerful family that love something fun. Feature it with more neutral-colored furnishing items like dark brown couch, black table, white media console, and light beige carpet. 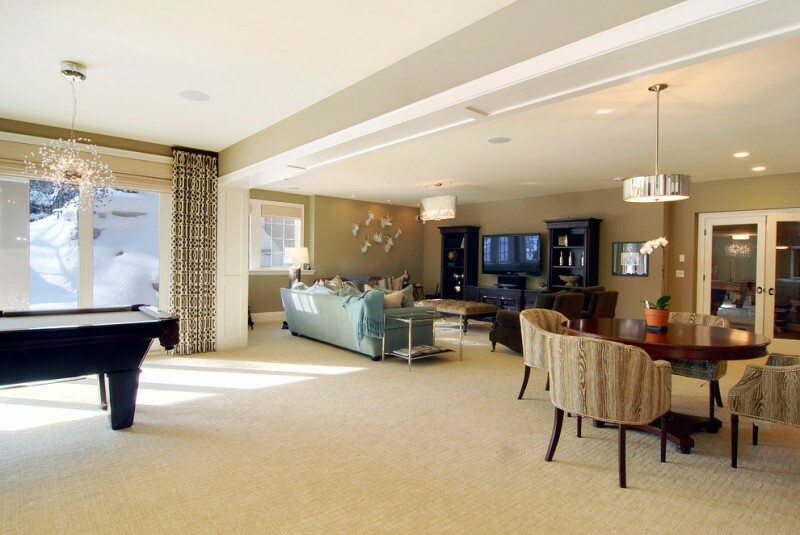 Make your basement living room more dramatic with semi-transparent beige curtains. Its golden tone appears when the curtains have been lighted on, giving glamorous look. Long white sectional looks so contrasting when being featured with dark purple tables, and dark carpet here is becoming a perfect base for both. 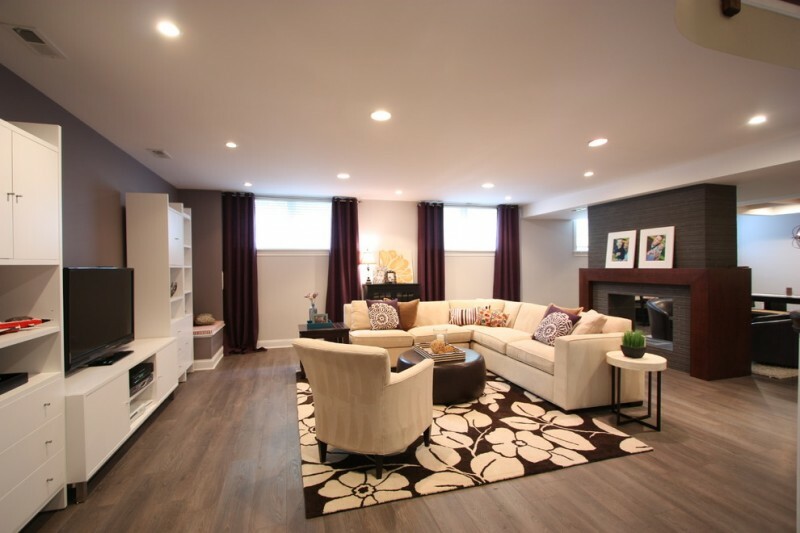 This is an idea of basement living room in modern style. 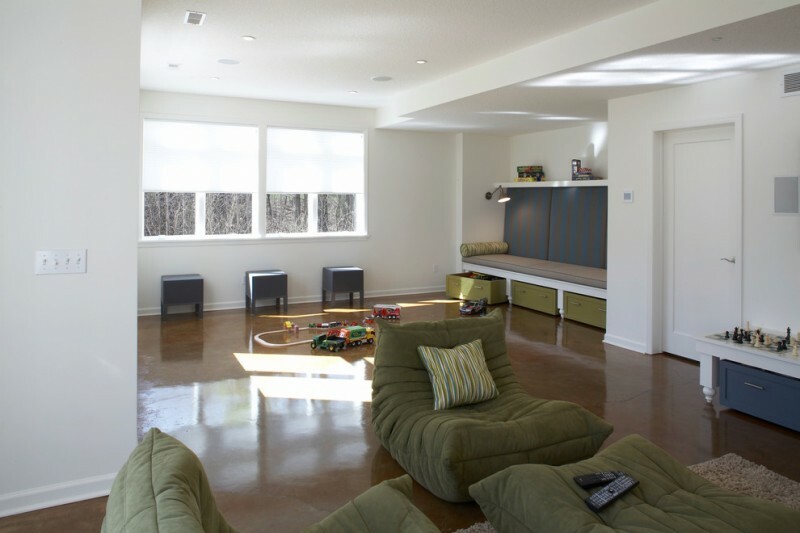 Soft and neutral colors dominate this space and here you’ve found earthy brown that’s mostly like chocolate milk tone as the basic color. The basement window curtains are also designed in similar tone to basement furniture, giving a good harmony in this space. 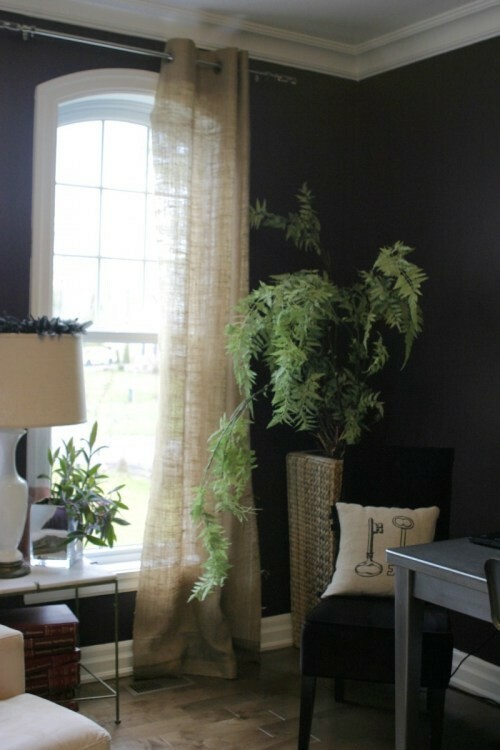 Dark wood curtains for basement windows could be a nice contrast for light grey walls and wood floors. Complement your basement living room with L-shaped white sectional plus few throw pillows and beautiful area rug with large flower motifs. To transform a basement into a cozy and trendy one, actually we just need to do little work like adding basement window curtains that can give attractive look. 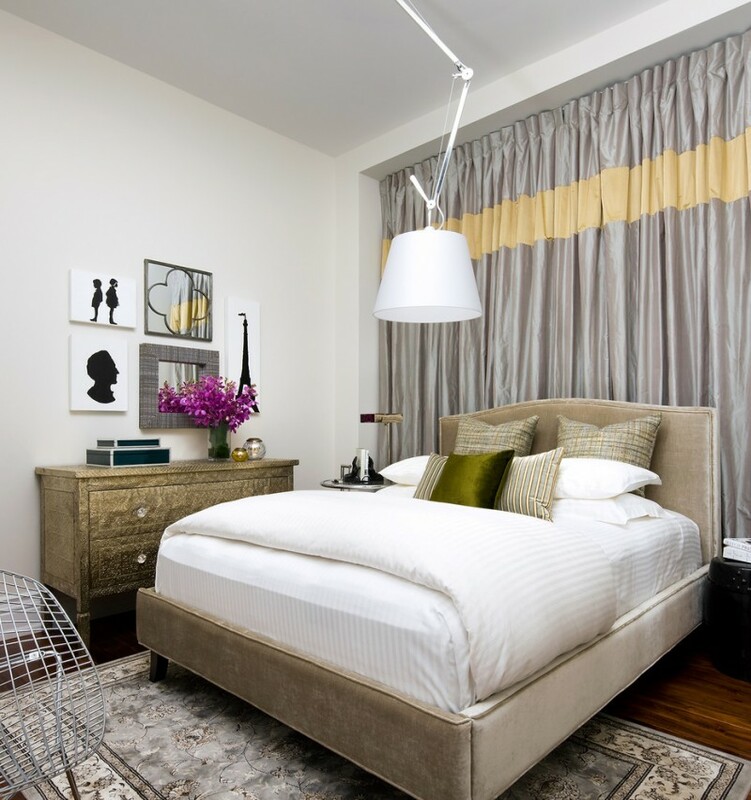 Long curtains in gold are just the example how the window curtains can act like decorative items as well as window treatment. Play with colors and lighting effect. Use the recessed lamps to light on certain area around the chairs, and soft maroon window curtains give a accent color to the room. 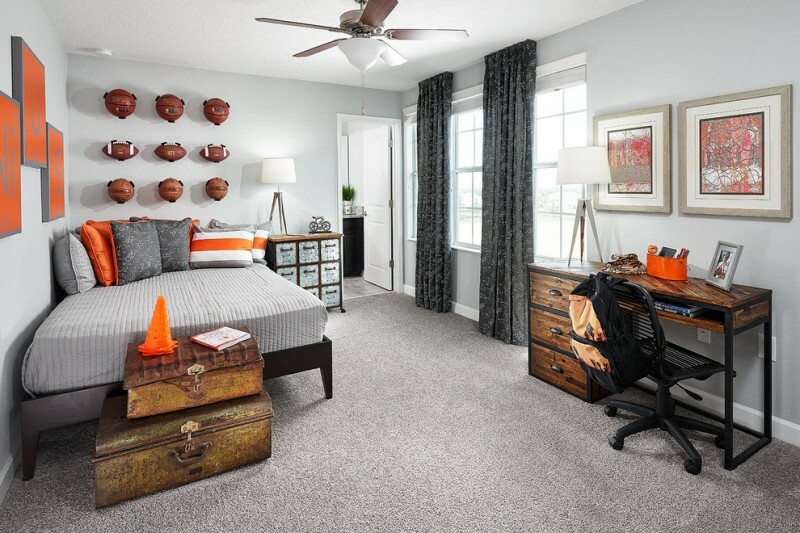 A large guest room in basement – This spot is specifically designed for the occasional visitors, but the owner wants a large space that can provide storage, crowd of children, and guests. Basement is transformed into a bright and colorful one by equipping the windows with the window kitchen curtains. 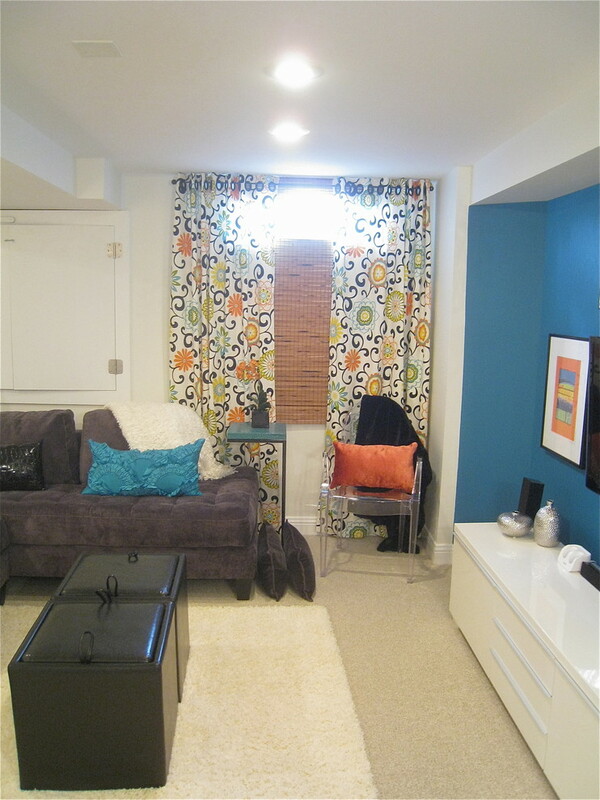 White basement window curtain is also a nice choice for a basement. 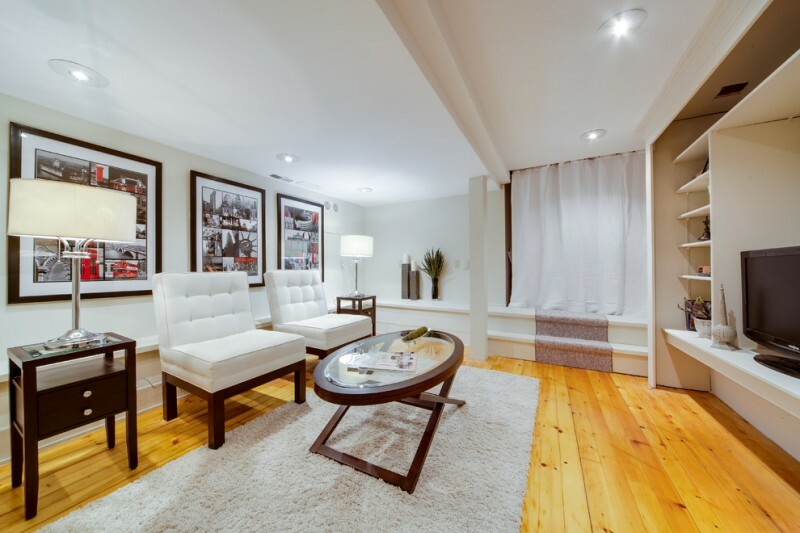 White is powerful in adding bright and clean feel to the room. 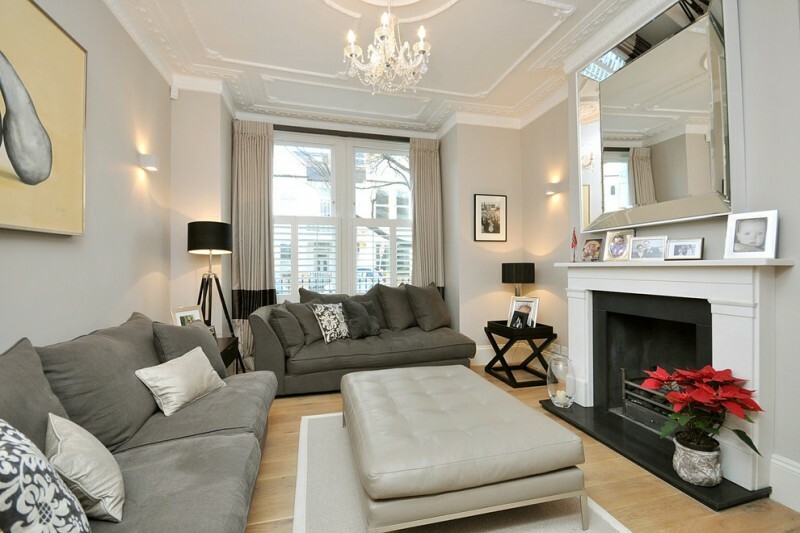 If you don’t want a contrast, white interior and furniture are well suggested. 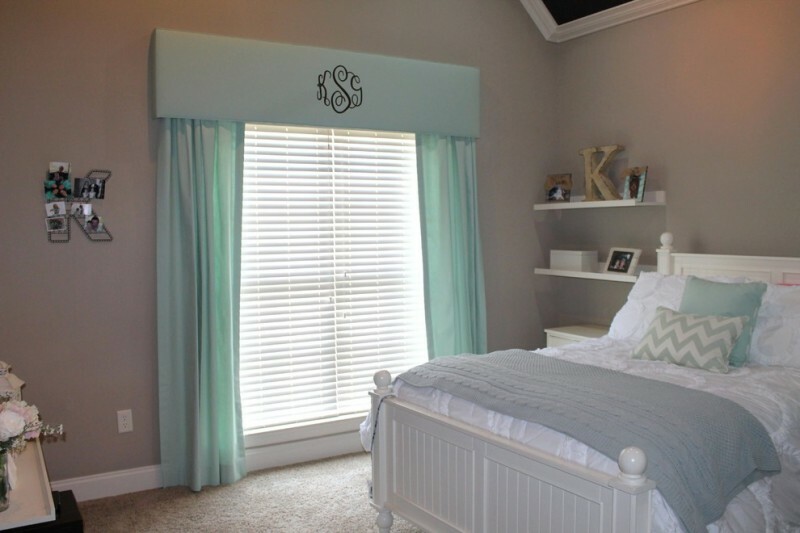 Pre-teens bedroom idea in basement accented with light blue curtains. The window has an opaque window sheer before the curtains. The shade is also installed as the window accessory. Color softness obviously reflects the teenagers life. If you love monochrome, it’s good idea to highlight your basement with such a trendy and chic monochromatic window curtains. 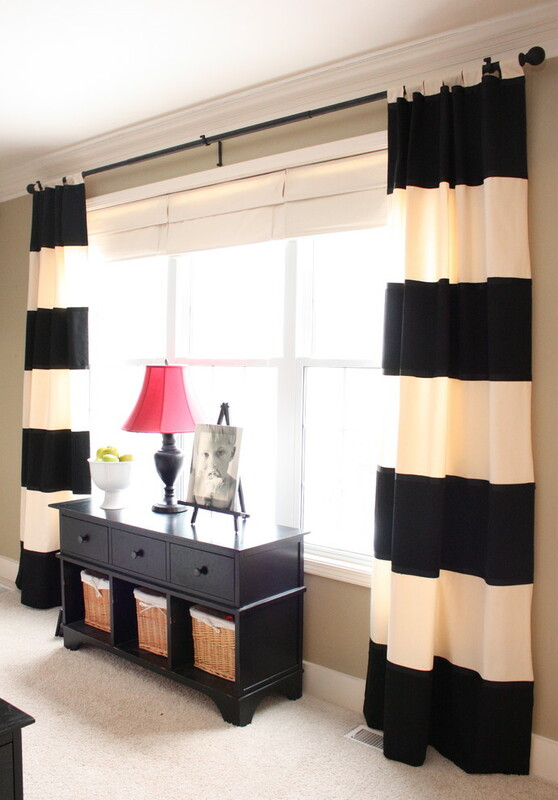 Choose large prints for a stunning window curtain and feature it with dark furniture at the center. What such a perfect idea! 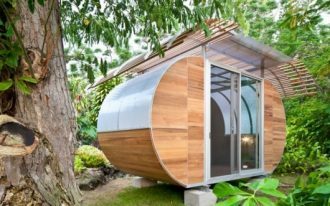 Want more sun protection and privacy? The window shades are quite recommended to add. 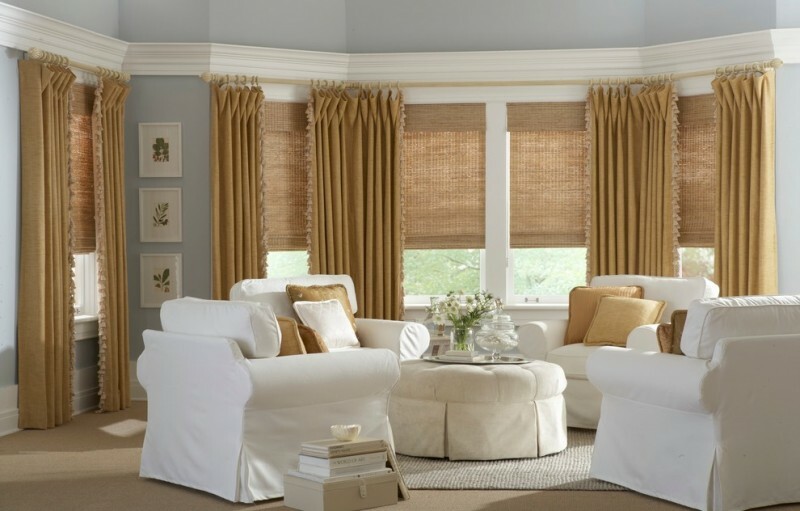 The shades are in similar color to the curtains’ base, giving a harmonious look, especially for the window area. Not always about curtains, you may ornate your basement windows with such a elegant window sheer. Its soft and semi-transparent look beautifully covers the basement windows. It will be nice if you make this window sheer as a dramatic background for your favorite seats. Add huge elegance with such a basement window treatment. 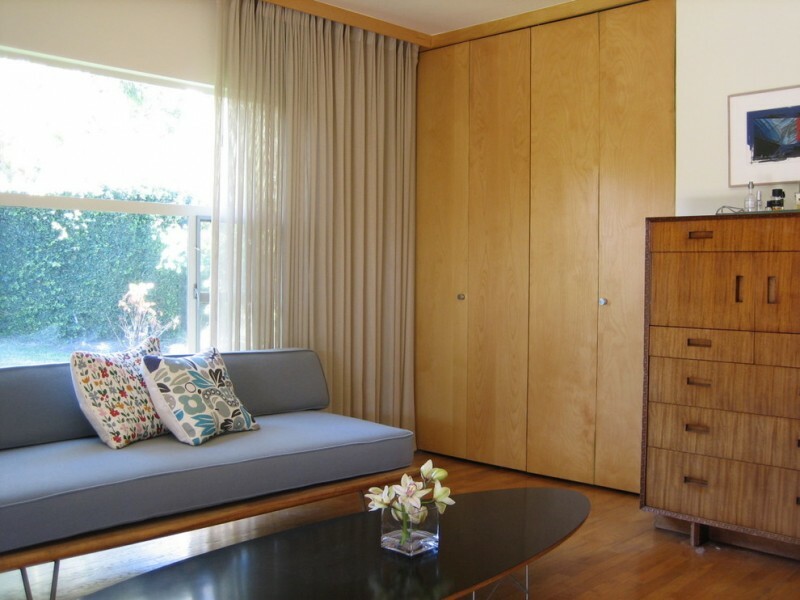 Floor-to-ceiling curtains are frequently chosen due to a perfection of covering the windows. You may add the window sheer that could give privacy and sunlight protection. With light blue and motifs, the curtains are being good contrasts to walls and furniture set around. 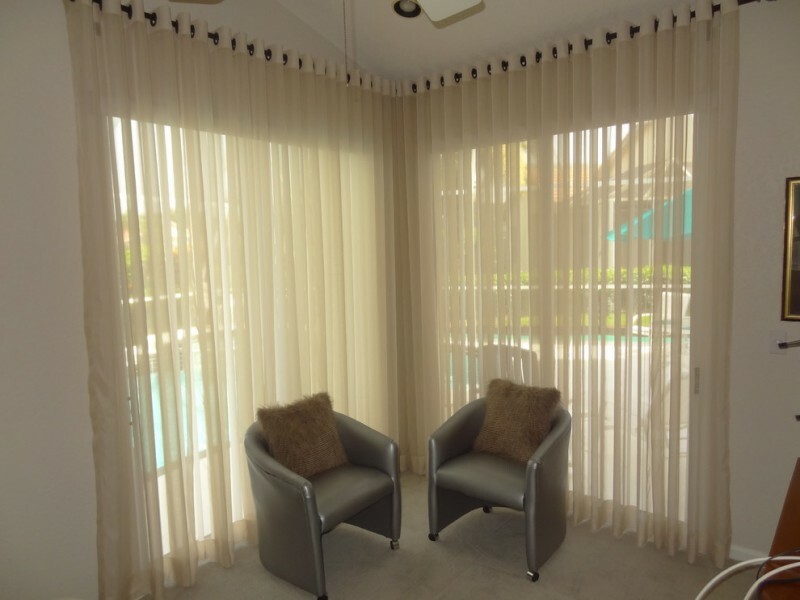 Use double window treatments for more privacy and light protection. Wood woven window shades could be added as the protector and privacy maker, and the curtains are just the decorative item. Make sure that you’ve selected the matched colors for the best look. Still about double window treatment idea. 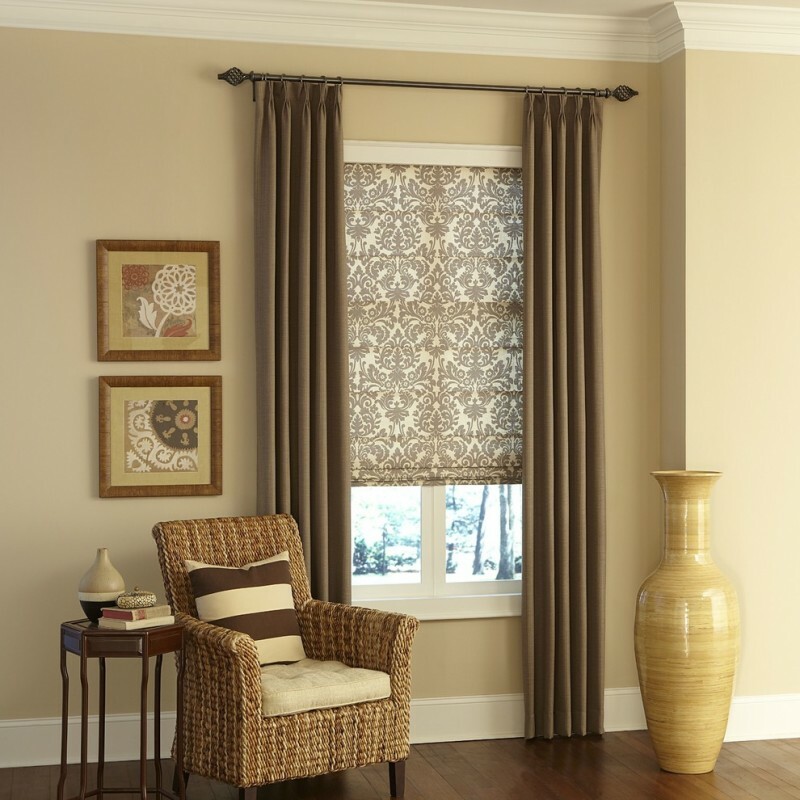 If you art lovers, you can select the window shade accented with traditional motifs. Feature it with similar tone curtains without any patterns/motifs. They won’t be failed; just try it guys. This is a lovely curtain. Its light color is obviously against the grey walls. They’re nice contrasts. White window shutters aren’t only the privacy creator and light blocker, but they’re also the beautifier. Feel fresh with dark citrussy green. Don’t be worried to combine the green with neutral color tones like grey. It would be so awesome! 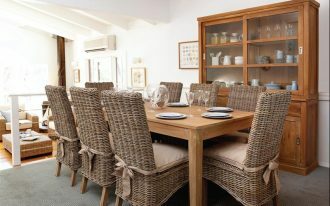 Adapt this idea for other rooms, especially the kitchen that’s identical with fresh and colorful fruits and vegetables. White curtains here are best such what the owner wants. All interior elements are set as the best match, especially for walls and trims, walls and curtains, and even walls and bedroom furniture. Each creates a beautiful contrast. How the walls match the window curtains! The curtain color brings much of elegance. Let the curtains’ base slip over the floors for more dramatic look. 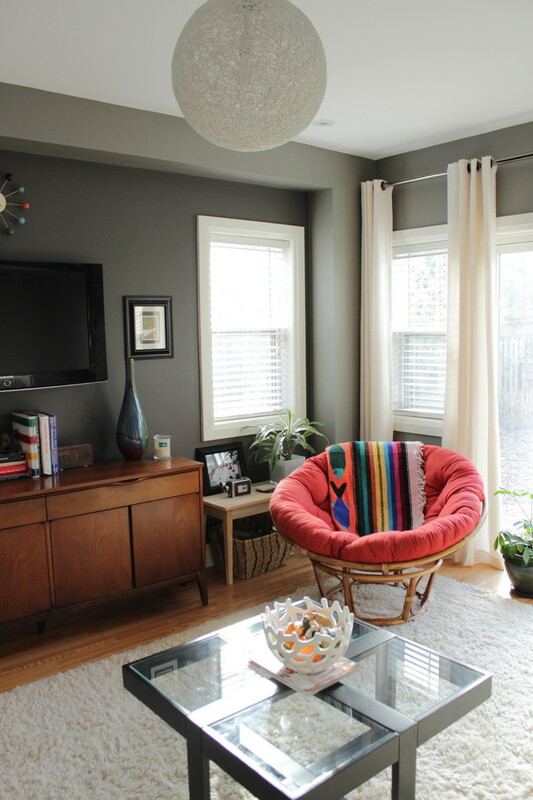 A trendy living room in a basement – Different to previous ideas, this idea of basement window curtains are exposing similar tone for dominant interior elements like walls, curtains, and even furniture. The idea lectures us what a perfect idea when we just use one color tone for our basement interior. Here, we wanna say: monotone isn’t always bad. An inspiring kids bedroom in basement. Pop of colors are dominating here, reflecting the kids’ soul that’s full of energy, cheerfulness, and fun. Bright purple colors are posted on several spots, including the curtains in which they’re gonna be brighter when the sunlight touches them, and warmer when the day turns into dark. Let the curtains flow over the floors to give a dramatic look. With glossy surface, the silk curtains glow elegantly in room, really matching with interior, particularly the walls and floors. 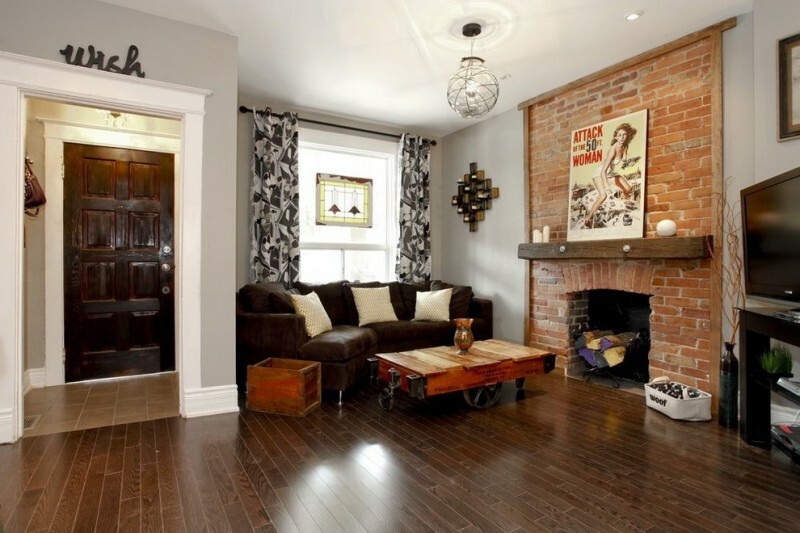 A sub-urban living room in basement. 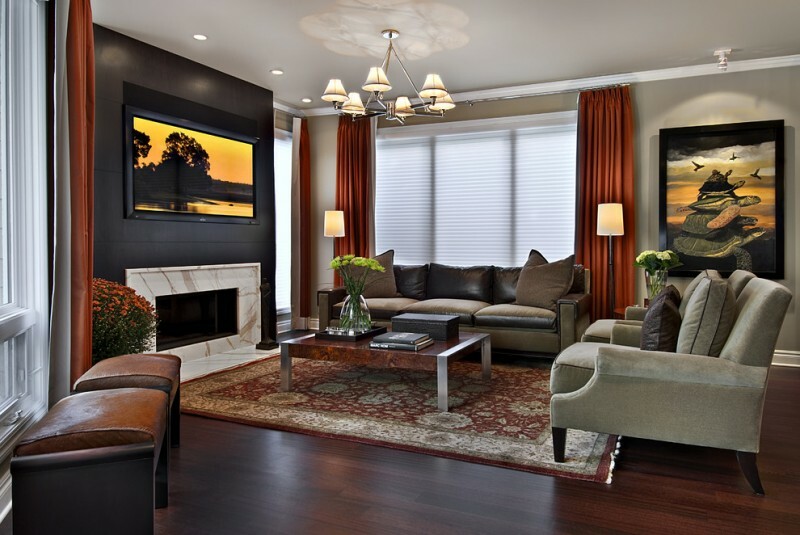 This is a nice choice of living room idea where you can use pop and neutral colors as a matching blend. Yellow curtains with motifs offer fun color in the middle of semi-formal living room. Boys’ bedroom idea with a little rustic. This bedroom is in basement and supported with large glass windows for sunlight access. Black curtains are included to manage amounts of light entering the room. The fabrics have particular motifs as the decorative accents and they’re fully covering the windows when needed. Light yellow is always warming and creating fun feeling. With these values, the basement bedroom will be cozier and brighter when the windows are supported by such fun color curtains. 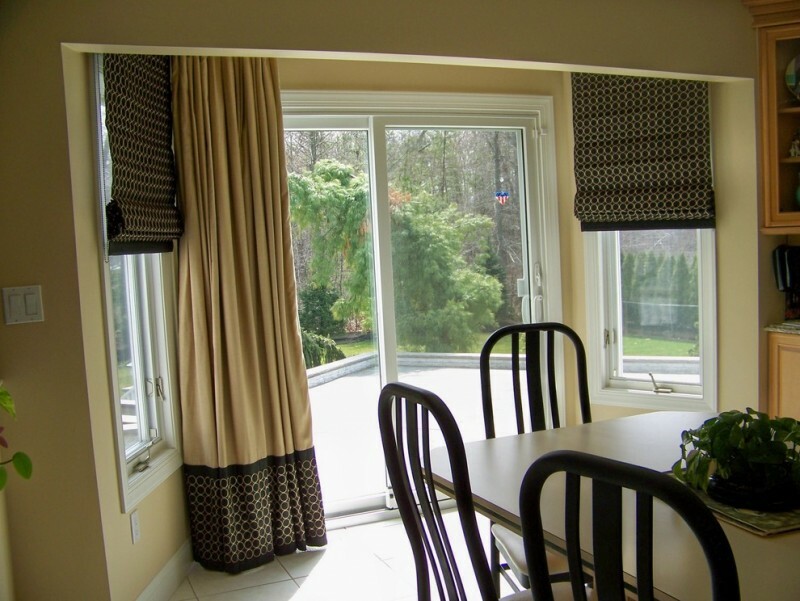 Curtains with mosaic patterns – another best choice for the basement windows. 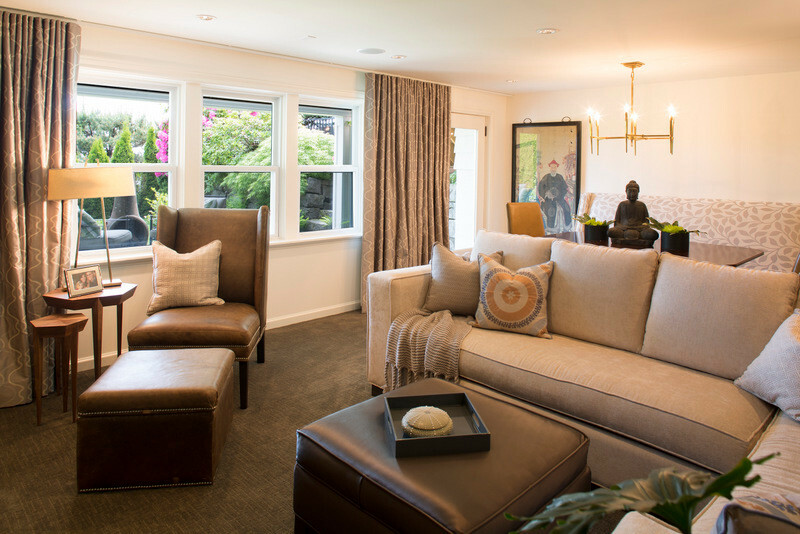 The fabrics give unique color tones and classic appeal to this modern rustic and casual space. 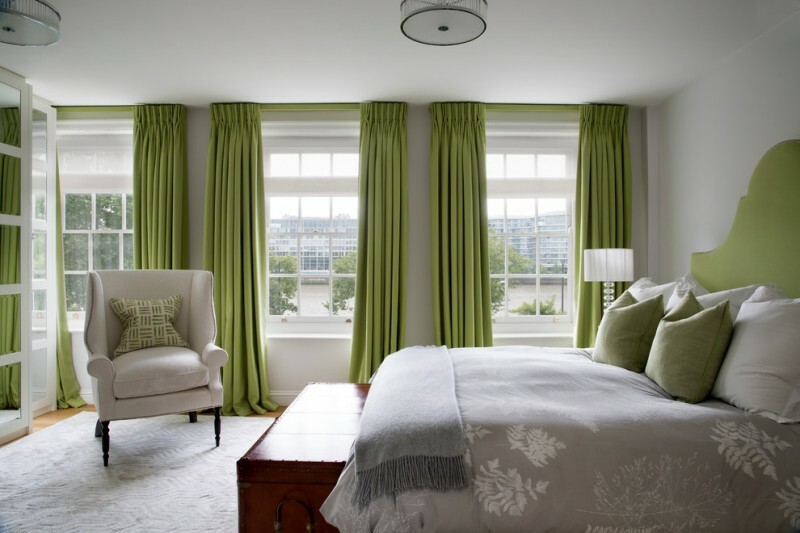 A master bedroom in basement with elegant green window curtains. The green becomes the most powerful one. It’s quite stunning and blends well with the color of bed furniture. Curtains are installed right to the ceilings. The space is dominated by white and grey, the peaceful schemes. Both are quite fresh and clean lines for such a contemporary basement bedroom. The curtains are made of semi-transparent linen. The color is clean and pure, giving an effect of larger space. 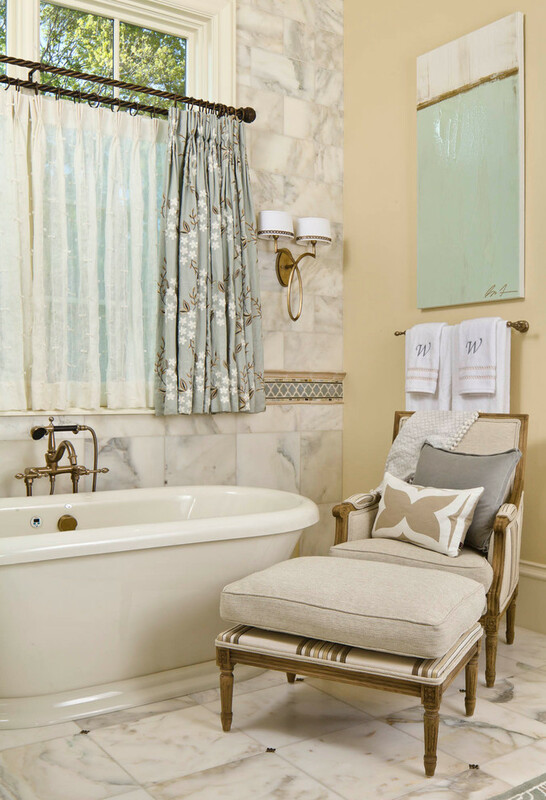 The color combination also makes us all cozier when getting relax in such spot. White and grey bring clean lines look, and the curtain here complements the room. It successfully hides the window and acts like the hung fabrics to ceilings. White window curtains and black-stained curtain rods are the best match. Both are good contrast, and fits any interior styles. 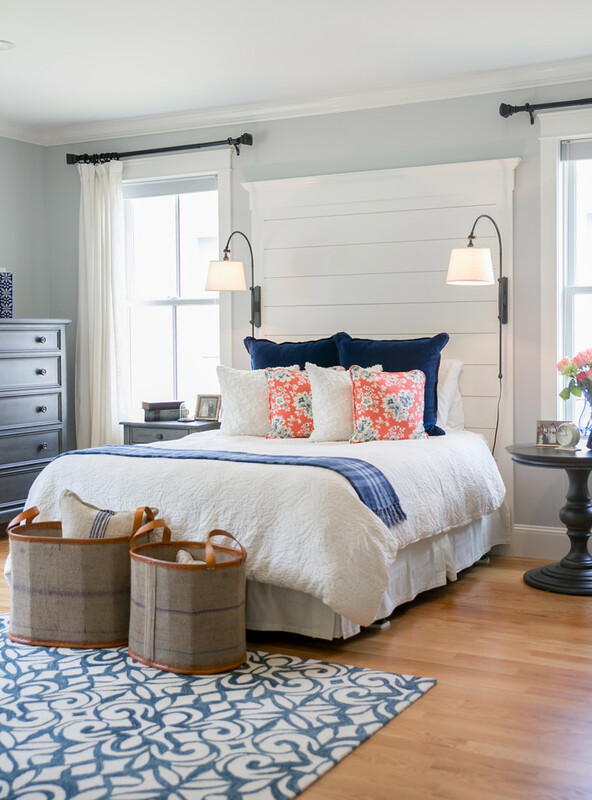 This master bedroom, for instance, is perfect when being featured with white window curtains that significantly contrast against soft grey, ivory, navy, and coral tones. 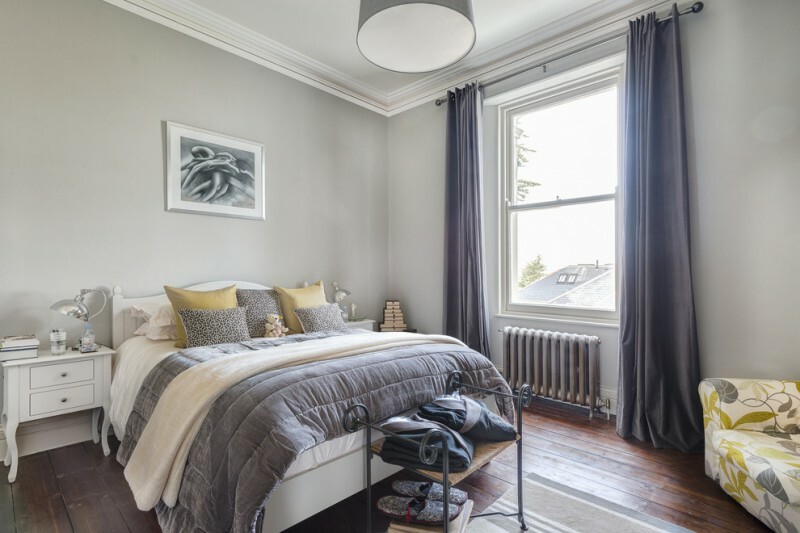 Calming hue – most people prefer warm color tones to cool ones for a bedroom, but this is different. 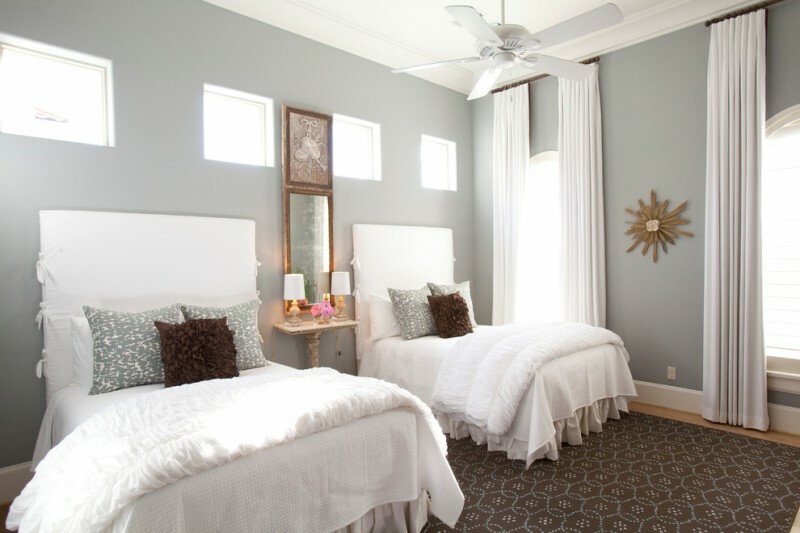 Cooler color tones are the better choice due to their calming effect. Grey, baby blue, and lilac promote us to rest, while warming color tones often energize and keep us up along night. Red is always powerful and can be a dominant tone in such room. You can use other powerful tones like black doffs, but consider to use the right proportion. An inspiring basement window curtains in English style. The curtains are designed with floral motifs and equipped with crystal holdbacks and tassels. White & semi-transparent window sheer have complemented the curtains. Add classic pendant lamp with warm and low-lighted ambiance to give a romantic nuance. Swinging curtains give a dramatic look to the room, and curtains’ top is really beautiful. 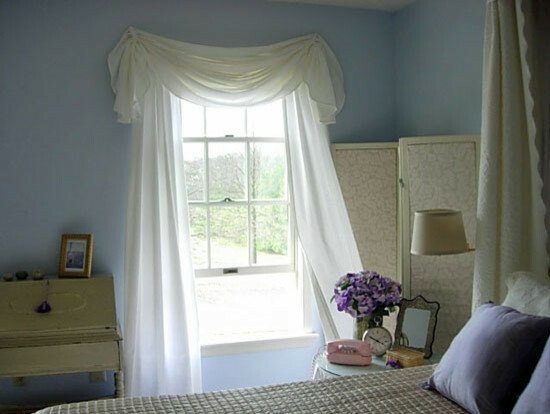 Baby blue walls are the nice background for the curtains; they’re really beautiful contrast that balances each other. Looking for a new inspiration of basement bathroom? You may try this idea. A timeless basement bathroom accented with trendy blackout cafe plus its window sheer; the window treatment has floral motif that obviously fits the interior concept. Burlap curtains for basement windows. This kind of fabric is inexpensive but can be a beautiful curtain for such Mediterranean style window. 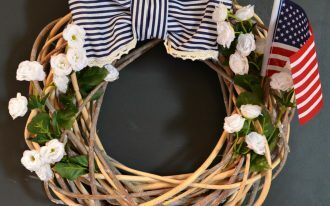 It can also make the space beautifully shabby. Burlap itself comes in many tone options, from soft beige to bold red. We commonly discover it as the tablecloth and lampshade. 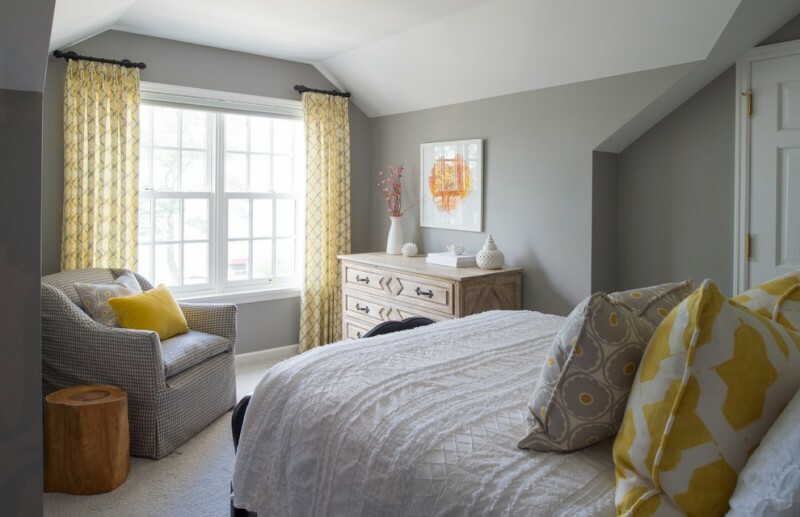 Glossy silver tone highlighted with bright yellow is another best option of window curtains for basement bedroom. 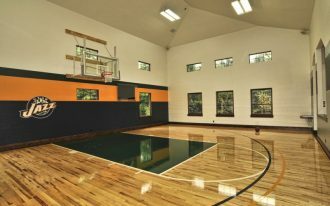 Whatever the space style and interior scheme, this will always be the updated one. Simple yet inviting. 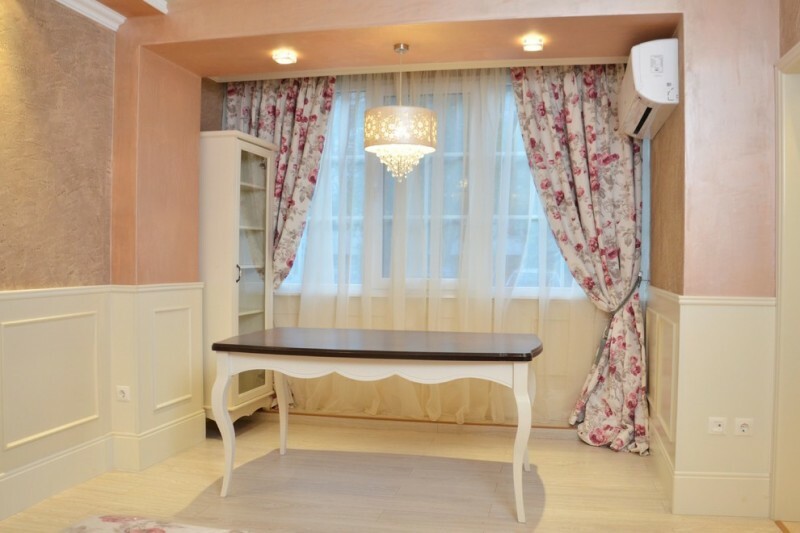 The curtains just have little accent color in edges, and the color contrasts with walls and floors in gentle way. Stripped window curtains for basement – It’s important to select the best fabric, color, and motif if you want to get the best window treatment for basement. 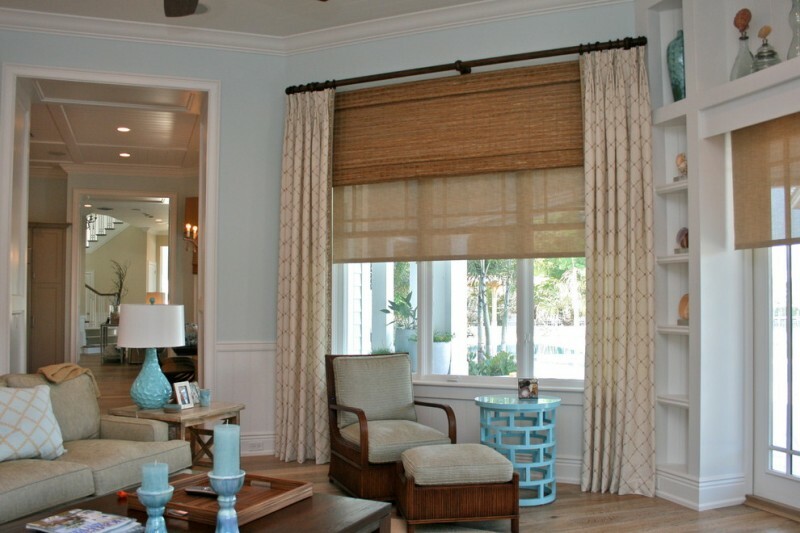 These vertical stripped curtains are just the example how light tone still works well with another light one. Add bright or bold-toned interior items that can be the accent colors in space. Another soft-toned curtain idea for soft-toned interior idea. You need to add a focal point that’s significantly powerful in look like this baby yellow corner chair. Pink throw pillow is just accessory but important to give another color in this room. Gold window curtains with gentle texture – they looks so luxurious and expensive, the big property for billions-dollars living space. 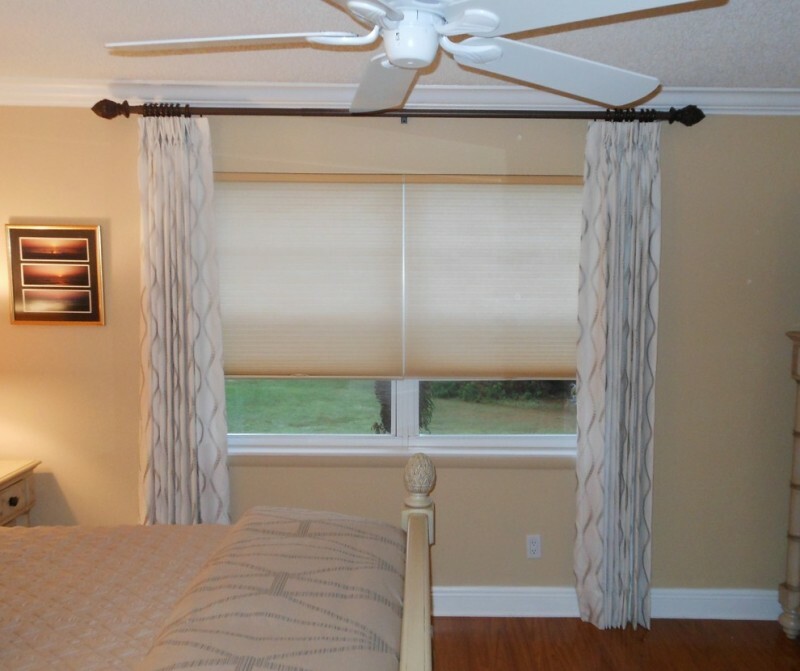 Black wrought iron rod and reels are the best matches for this kind of window treatment. 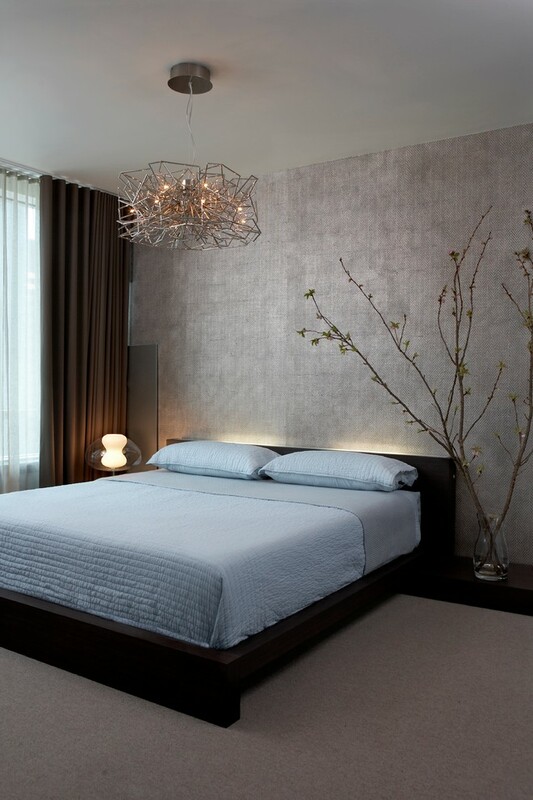 Use light cream or bronze-painted walls as their background and get a couple of classic wall lamps as the wall arts. 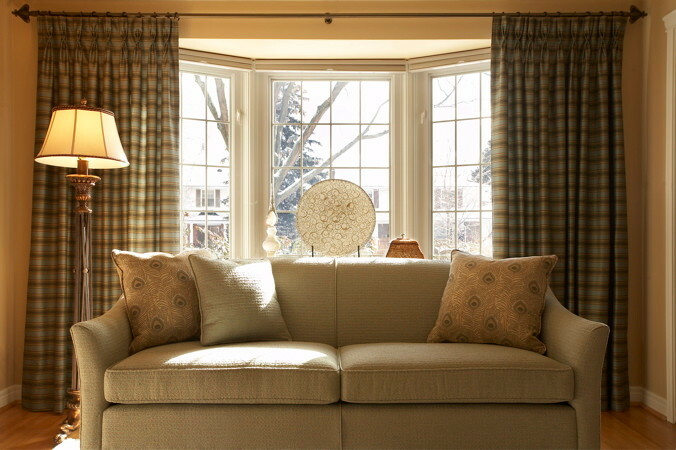 Window curtains behind a sofa – it’s so classic but timeless. The fabrics are custom and they act like a decorative layer of window that presents a visual interest. With such kind of window treatment, the homeowners can enjoy the framed view every time they want.